Lorna Tilley has just completed her PhD studies in the School of Archaeology and Anthropology at the Australian National University in Canberra. Her PhD thesis focused on the behavioral and social responses to the individual experience of disability in prehistoric communities. Lorna has developed a methodology titled the ‘bioarchaeology of care’ that contextualises, identifies and interprets care-giving in the archaeological record. Lorna can be contacted at lorna.tilley@anu.edu.au. These Bones of Mine: Hello Lorna and welcome to These Bones of Mine! Firstly could you tell us a little about yourself and your research interests? Lorna Tilley: Hello David – and thanks for having me. I’m a latecomer to archaeology. Ten years ago I decided I needed a change in life direction, so I returned to university to indulge a long-held passion for prehistory. I studied for a Graduate Diploma in Archaeology at the Australian National University (this was a ‘bridging course’ for people with qualifications in another field), and was then awarded a scholarship to undertake the PhD research which resulted in the bioarchaeology of care approach. Stepping back, my first degree (1981) was in behavioural and social psychology – in other words, a focus on the study of human behaviour in the present, which from the very beginning provided an invaluable perspective for addressing questions about behaviour in the past – because, for me, archaeology is fundamentally about understanding people and their agency. My background in psychology made a major contribution to constructing the conceptual foundations for the bioarchaeology of care. I’ve had the usual range of mundane to exotic jobs, all of which are part of the life history I bring to interpreting evidence from the past. But it’s my work in the healthcare sector that’s most immediately relevant to my archaeological research into the implications of healthcare provision in prehistory. For example, after leaving school and through part of my first go at university I did quite a bit of nursing – in public and private hospitals and in nursing homes, including work in general nursing, care of the intellectually disabled, rehabilitation and aged care. While I didn’t go on to qualify as a registered nurse, this hands-on experience clearly helped to inform development of aspects of the bioarchaeology of care methodology. I’ve also helped develop public health policies and programs, and for almost a decade before beginning archaeological studies my job included advising on, monitoring and disseminating research on health outcomes assessment and health status measurement. All this fed into my work in developing a bioarchaeology of care methodology that, while qualitative and – inevitably – restricted to individual cases of care-giving, nonetheless provides a level of standardisation that allows review and replication by others. My PhD thesis is titled Towards a Bioarchaeology of Care: A contextualised approach for identifying and interpreting health-related care provision in prehistory, so it’s fairly obvious where my research focus lies – the provision and receipt of health-related care in prehistory, and what such instances of care can reveal about both the community in which care occurred and the agency and identity of those involved in the care-giving relationship. Being insatiably curious, however, my interests are even wider – any evidence of superficially anomalous behaviour in the past grabs my attention. Why did the people of this community make pots in this way rather than that? Why are people in one cemetery buried in seemingly random orientations and positions, when people in a contemporary neighbouring cemetery are all buried supine, extended and with heads to the east? Why are stone tools found in a certain site made from materials sourced over a hundred miles away, when there is perfectly serviceable stone available in the immediate vicinity? And so on. TBOM: Could you explain your methodology, the ‘bioarchaeology of care’, and a bit of background as to why you thought it was necessary to produce such a method? Lorna: Firstly, the methodology itself. I won’t go into a lot of detail here (this would take pages), but for readers wanting more I’m attaching the text version of an invited article describing the bioarchaeology of care approach for the theme issue ‘New Directions in Bioarchaeology’, published in the Society of American Archaeologists’ journal The Archaeological Record, May 2012. In brief, the bioarchaeology of care is an original, fully-theorised and contextualised case study-based approach for identifying and interpreting disability and health-related care practices within their corresponding lifeways. Its goal is to reveal elements of past social relations, socioeconomic organisation and group and individual identity which might otherwise slip below the radar. And that would be our loss. Before describing the applied methodology, some scene-setting is necessary. 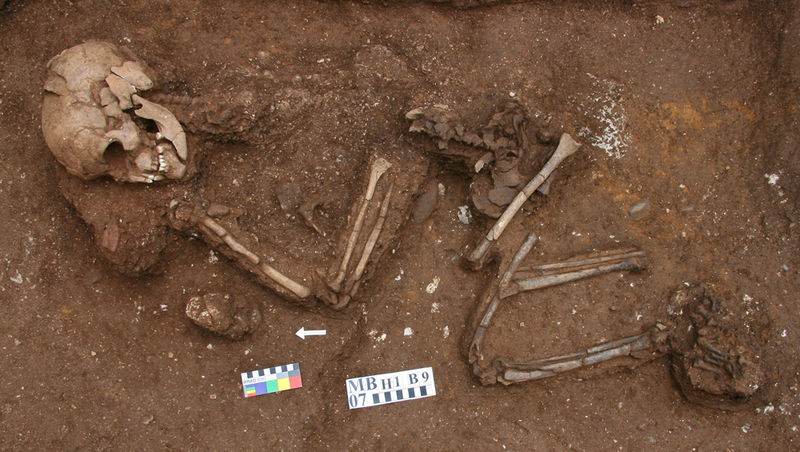 In archaeology, the experience of pathology during life may be expressed in human remains through anomalies in either bone or preserved soft tissue. Health-related care provision is inferred from physical evidence that an individual survived with, or recovered from, a disease or injury likely to have resulted in serious disability. Following from this, I define ‘care’ as the provision of assistance to an individual experiencing pathology who would otherwise have been unlikely to survive to achieved age-of-death. This care-giving may have taken the form of ‘direct support’ (such as nursing, physical therapy, provisioning) or ‘accommodation of difference’ (such as strategies to enable participation in social and economic activity) or a mixture of both. I use the term ‘disability’ in the same way as the World Health Organisation – to refer to a state (temporary or longer-term) arising from an impairment in body function or structure that is associated with activity limitations and/or participation restrictions, and – very importantly – given meaning in relation to the lifeways in which it is experienced. The central principle driving the bioarchaeology of care approach is that caring for a person with a health-related disability is a conscious, purposive interaction involving caregiver(s) and care-recipient(s). Care is not a default behaviour – care giving and care-receiving constitute expressions of agency. Neither does care take place in a void – understanding the context of care provision is absolutely essential in trying to understand (i) what constitutes ‘health’, ‘disease’ and ‘disability’ in the first place; (ii) the options available for care and the options selected; and (iii) what the likely choices made in relation to care reveal about the players involved. If we can deconstruct the evidence for care within this framework, then we may be able to achieve some insights into aspects of culture, values, skills, knowledge and access to resources of the society in which care-giving occurred. And if we can draw out some understanding of how the person at the receiving end of the care equation responded to their experience of disability we can even, perhaps, achieve some feel for aspects of this individual’s identity. If you think this sounds deceptively easy, you’re right. There are important caveats, and some of these are identified in the attached article. 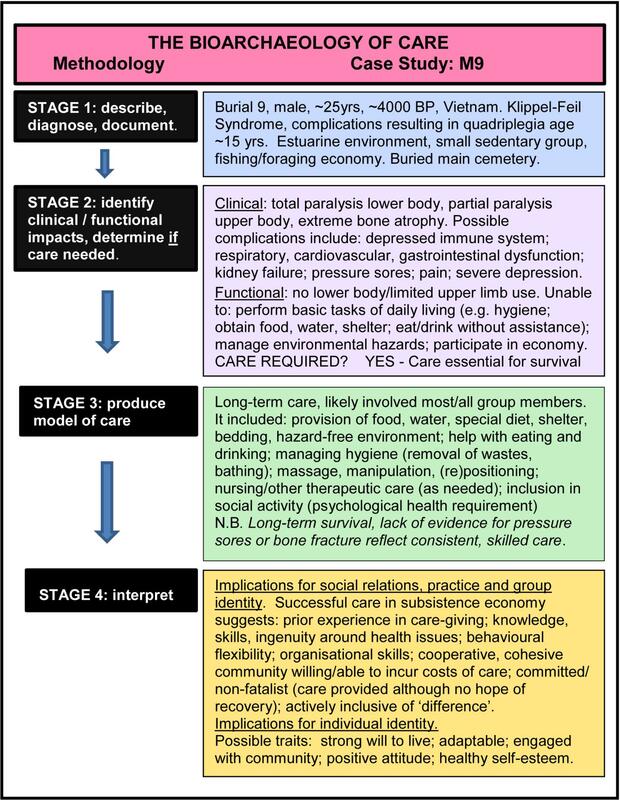 The bioarchaeology of care methodology comprises four stages of analysis: description and diagnosis; establishing disability impact and determining the case for care; deriving a ‘model of care’; and interpreting the broader implications of care given. Each stage builds on the contents of preceding ones. Stage 1 is triggered by human remains showing evidence of living with, or following, a serious pathology. It records every aspect of the remains, the pathology, and the contemporary lifeways. Stage 2 considers the likely clinical and functional impacts of the pathology on the subject. Modern clinical sources are used to consider likely clinical impacts. This is legitimate because human biology is a constant; tuberculosis, for example, would elicit the same potential range of physiological responses in the past and present (it’s important to remember that each individual with this disease will respond in their own way, and that we can never recover this level of individual detail). Estimating functional impacts involves considering likely demands, obstacles and opportunities in the contemporary lifeways environment, and evaluating the probable effects of clinical symptoms on the subject’s ability to cope with these. For example, could the individual have carried out the most basic tasks necessary for personal survival – such as feeding or toileting themselves – often referred to as ‘activities of daily living’? Or an individual may have been independent in this regard, but could they have fulfilled all the requirements of a ‘normal’ role (whatever that might have been for someone of their demographic) in their community? The second stage establishes whether, on balance of probability, the individual experienced a disability requiring either ‘direct support’ or ‘accommodation’. If the answer is ‘yes’, then we infer care. Stage 3 identifies what – in broad terms – this care likely comprised, producing a ‘model of care’ within the parameters of the possible and the probable in the contemporary context. The fine details of care will always be inaccessible, but basic practices – such as provisioning, staunching bleeding, massage and manipulation – don’t change. Sometimes there may be evidence of treatment intervention in the remains themselves, but most often the practical components of treatment will be deduced from knowledge of the likely clinical and functional impacts. Stage 4 unpacks and interprets the model of care developed over the first three stages. It explores what the constituent elements of care-giving – singly or in combination – suggest both about contemporary social practice and social relations and about group and individual (care-recipient) identity. I’ve presented the case of the Burial 9 (M9) so frequently over the last few years that I almost feel I know him personally – M9 was the young man from Neolithic Vietnam who lived for around a decade with total lower body paralysis and limited upper limb mobility following complications of a congenital condition (Klippel-Feil Syndrome). His survival with (partial) quadriplegia for approximately 10 years, under very physically and psychologically challenging conditions, provides an indisputable example of past health-related care. There is simply no way that he could have survived without constant and often intensive care provision. In the graphic that follows I’ve mapped the analysis of M9’s experience against the four stages of the bioarchaeology of care methodology described above. More detailed information can be found in ‘Tilley, L. and Oxenham, M.F. 2011 Survival against the odds: modeling the social implications of care provision to seriously disabled individuals. International Journal of Paleopathology 1:35-42.’ (anyone having difficulty obtaining the article can email me). You also asked me why I thought it necessary to develop the bioarchaeology of care approach. Researching my thesis I found at least 35 publications, dating back over more than 30 years, that explicitly identify the ‘likelihood of care provision’ in respect of archaeologically-recovered individuals. But none has analysed the evidence for care in a structured, systematic manner capable of providing access to the sort of information illustrated in the case study of M9. It was obvious to me – particularly given my pre-archaeology experience – that a very rich source of information was being overlooked. True, the bioarchaeology of care only allows us to look at individual instances of care-giving (this is elaborated in the attached article) – but this case study focus provides a very intimate look at broader aspects of past lifeways. Not quantity, perhaps, but quality. TBOM: Are there any boundaries as to when the ‘bioarchaeology of care’ model can and can’t be applied to individuals in the archaeological record? Could you apply it to historic and prehistoric contexts, or is it mainly a tool for prehistoric cultures and periods? Lorna: In developing the bioarchaeology of care I concentrated exclusively on evidence for health-related care-giving in small groups up to, and around, the period of the ‘early Neolithic’ – in other words, the time before the establishment of larger, more socially and economically complex, settlements. This was entirely pragmatic – to make my task simpler, I wanted to deal with lifeways contexts in which it would be justifiable to assume that an individual with a disability would likely be known to all community members, and where it would also be justifiable to assume that, if care provision entailed substantial cost, that cost was likely to have been an impost born by the group as a whole. This made it easier to figure out how analysis and interpretation might work. I don’t see any reason why the bioarchaeology of care couldn’t be applied to later prehistoric and even historic settings – and actually, I’d love to do this. It would obviously involve looking at some additional and/or different questions – for example, how might individual status within the group be related to need for, and receipt of, care? What happens to care-giving when healthcare provision is outsourced to ‘specialist’ carers? And how do documented approaches to healthcare (particularly in early historic periods) tally with what the archaeological evidence suggests? Exploring such questions will be a lot more complicated than I’ve made it sound here. But how challenging to look for possible answers! TBOM: As stated in your 2011 article in the International Journal of Palaeopathology, the ‘bioarchaeology of care’ models the social implications of disability for the impact on not just the individual afflicted but the society as a whole, why is that such an important part of the model? Lorna: I hope that I’ve already answered this question – at least implicitly – in what I’ve written above. Perhaps it would be acceptable to limit bioarchaeology of care analysis to teasing out the impact of disability on the individual alone, but it would only be part of the story – and it seems to me that to stop at this point would be a criminal waste of the sparse evidence we have about past lives and lifeways. I think it’s quite possible that some archaeologists dealing with evidence of likely care-giving may have to stop at Stage 3 of the methodology, because not enough is known about the social, cultural and physical environment in which care was provided to enable an attempt at further interpretation. That’s fair enough. However, I also think that some researchers may be so uncomfortable in attempting the interpretive analysis demanded in Stage 4 that they’ll decline to do so, on the grounds that such analysis is merely ‘speculation’. I think that’s a shame. I don’t think there’s ever 100% certainty in archaeological interpretation. But what matters is that we approach the task of interpretation systematically, rigorously and transparently, presenting arguments in such a way that others can follow the steps taken and, where appropriate, challenge both the evidence and the reading of the evidence – refining and even recasting conclusions reached. Even putting forward possibilities later shown to be improbable opens our minds to considering a broader vision of the past. This sounds a bit abstract, I know – but I’d invite readers to return to the graphic summarising the bioarchaeology of care analysis of M9’s experience. M9 comes from the Man Bac community. Before the bioarchaeology of care analysis we knew quite a lot about how this group lived in general terms – their diet, economy, demography and mortuary customs. But we didn’t know anything about who they were – and now I think we do. I think the bioarchaeology of care analysis revealing the agency of caregiving can pay rich dividends. An in-situ photograph from the early Vietnamese Neolithic site of Man Bac displaying the individual known as M9 immediately before removal. Man Bac burials were typically supine and extended, but M9 was buried in a flexed position – this may reflect muscle contracture experienced in life and unbroken in death, or a deliberate mark of difference in mortuary treatment. M9’s gracile limbs show extreme disuse atrophy, a product of quadriplegia resulting from complications of Klippel-Feil Syndrome (Tilley & Oxenham 2011: 37). TBOM: Dettwyler, in her 1991 article ‘Can palaeopathology provide evidence for compassion?’, questioned the assumptions underlying the inferences of archaeologists and human osteologists, and famously stated “what, then, can we learn of compassion from a study of bones and artifacts?” The answer must be, “practically nothing”. How does your own methodology change or challenge this view? Lorna: While it’s true that the title of Katherine Dettwyler’s article is ‘Can paleopathology provide evidence for compassion?’, the real argument in this article is that archaeology can tell nothing meaningful about individual experience of disability in its entirety. The author questions whether archaeological evidence for disease can be used to infer a disability requiring care in the first place, and uses ethnographic analogy to support this position. I’ve probably said enough about the bioarchaeology of care approach to make it clear how strongly I oppose this view. While I greatly admire Dettwyler’s passionate support for the modern disability rights agenda – which I see as the sub-text of her writing – I disagree with almost every point she makes in her article about archaeology’s (lack of) ability to identify care and compassion in the past. I’ll just make a couple of general observations here. I think one of the most fundamental problems with this paper is that it doesn’t provide clear definitions of concepts central to its argument. Disability (or ‘handicap’, a more commonly used term twenty years ago) is referred to as a purely social construct throughout, and this allows the proposition that what constituted disability in prehistory must forever be unknowable because the social values that determined disability are inaccessible through archaeological analysis. But this ignores the reality of the at least partially ‘knowable’ clinical and functional impacts that people with health-related disabilities also have to manage in their lives. Discerning social disadvantage may be problematic, although arguably not always completely impossible, but – as demonstrated by the bioarchaeology of care methodology – given adequate contextual information it’s possible to identify some of the likely barriers to participation in cultural, economic and physical activities that required a care-giving response. The paper also conflates ‘care-giving’, which is a behaviour, and ‘compassion’, which is a motivation, and fails to define either. This is of significant concern, because these terms have very different meanings. It is undeniably easier to infer the likely provision of care-giving from physical evidence in human remains than it is to identify the motivation(s) underlying this care, which are always going to be multiple and messy – because this is simply how life is. I believe that this semantic confusion, allied with a lack of consideration of the clinical and functional implications of disease, invalidates both the five ‘implicit assumptions’ presented by the author as underlying archaeological interpretations of disability and the paper’s criticisms of the three studies (Shanidar 1, Romito 2 and the Windover Boy) used to illustrate supposed deficiencies in archaeological claims for care. Katherine Dettwyler’s 1991 article has had a powerful negative influence on archaeological research into health-related care-giving, and it’s widely cited in explaining why such research is ‘impossible’. I think the bioarchaeology of care approach shows the exact opposite – not only is research into past care-giving eminently possible, but in terms of getting an insight into complex, interpersonal dynamics operating in prehistory it’s potentially one of the most rewarding areas of focus available. TBOM: Having now completed your PhD study at the Australian National University, what is the next step for yourself and your research? Are you continuing projects in South East Asia, with on-going excavations in Vietnam? Lorna: I’ve got a couple of projects in mind. Firstly, I’m hoping to turn ‘Towards a bioarchaeology of care’ into a book. There’s already been some interest in my dissertation from (bio)archaeologists as well as from researchers in other disciplines, so I’m hoping that such a book would have an audience. Anyone interested in exactly what my thesis covers can email me (lorna.tilley@anu.edu.au), and I’ll send you my thesis abstract. Secondly, my thesis introduces the Index of Care, which is a non-prescriptive, computer-based instrument intended to support ‘thinking through’ the application of the four stages of the bioarchaeology of care methodology. I describe the Index as a cross between a prompt and an aide-mémoire, and I’m planning to develop it as a web-based application freely available to anyone who wants to use it. The present Index is in the very early beta version stage – I’m responsible for the content and interface design, and I’m open in saying that these require a lot more work! (My partner did the actual IT production, so I take no credit for this aspect – which actually works!) I’ll be calling for volunteers interested in helping to test and provide feedback on the Index in the near future, and I’d love to hear from anyone interested in learning more about this project. 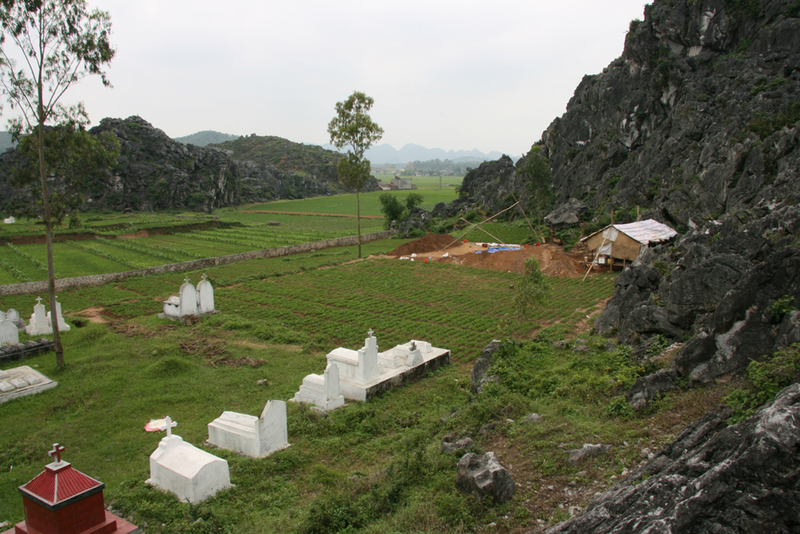 Regarding excavations – well, immediately after submitting my thesis for examination I went out to dig for four weeks in the Northern Vietnamese pre-Neolithic site of Con Co Ngua (~6000BP). It was great to get my hands in the dirt again after the extended dissertation-writing vigil in front of the computer! However, analysing the over 140 remains recovered from this site will likely take years – so, even as we speak, I’m chasing up other options for expanding on the bioarchaeology of care work done to date. The Man Bac excavation site in Vietnam where the individual M9 was found and excavated. The archaeological site can be seen centre right, whilst a modern cemetery takes precedence in the foreground. TBOM: That brings us to the end of the interview Lorna, so I just want to say thank you very much for your time! Lorna: David – and any readers that have made it this far – thank you for asking me along and for being interested. I can’t sign off without saying how much I value this website – it is dangerously seductive in coverage and content. Dettwyler, K. A. 1991. Can Palaeopathology Provide Evidence for “Compassion”? American Journal of Physical Anthropology. 84: 375-384. Tilley, L. 2012. The Bioarchaeology of Care. The SAA Archaeological Record: New Directions in Bioarchaeology, Part II. 12 (3): 39-41. Oxenham, M. & Tayles, N. G. (Eds.) 2006. Bioarchaeology of Southeast Asia. Cambridge: Cambridge University Press. Oxenham, M., Matsumura, M., & Nguyen, D. Kim. (Eds.) 2011. Man Bac: The Excavation of Neolithic Site in Northern Vietnam (Terra Australis 33). Canberra: Australian National University E Press.